Providers of both standard and smoker annuities increase their rates during the month as the 15-year gilt yields improve despite a volatile market with uncertainty in Europe over Greece exiting the euro. With uncertainty over Greece and a possible exit from the euro volatility has increased in the gilts and bonds market. 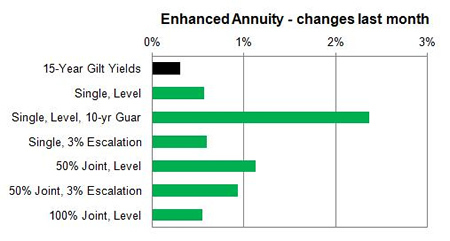 Even so the 15-year gilt yields ended the month slightly higher and never fell below the starting yield of 2.18% giving annuity providers the confidence to improve rates by over 5% in some cases. 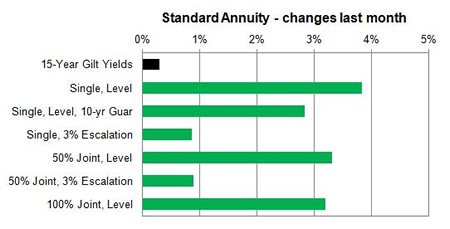 Standard providers were higher by an average of 2.66% and we would expect to see a decrease of 2.36% in the short term and in the medium term of 3 months annuity rates will decrease by 2.53% if yields do not improve further. 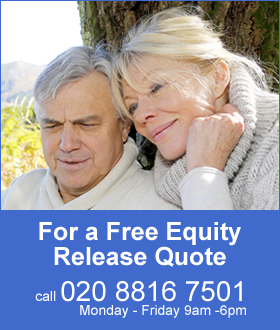 Smoker and enhanced annuity providers increased their rates by 1.10% on average with a decrease of 0.80% possible in the short term and in the medium term of 3 months we can expect an increase of 0.96%. Equity markets started at 6,961 and increased by 23 points to end at 6,984. The majority of rates increased with 83% rising, 11% remaining unchanged and 6% decreasing. Standard annuities increased this month with the highest for single life aged 55 increasing by 5.70% followed by 50% joint life aged 65 with 4.88%. The smallest increases were from 3% escalating rates for single and joint life from age 55 to 70. For enhanced and smoker rates were higher but in particular for single life with a 10-year guaranteed period aged 60 to 75. There were some decreases for single life level and 3% escalating rates of between 1.32% to 1.76%.